Lions Den Theatre will leave you with a smile on your face. 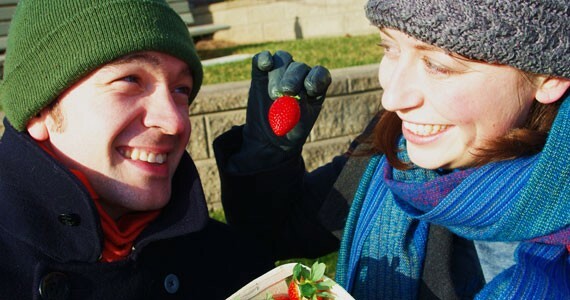 Dan Gervais (Francois) and Jozel Bennett (Sophie) of Strawberries in January. The beginning of January is often a theatre wasteland (who wants to be in rehearsal over the holidays? ), but this year we've already had LunaSea's stunning Estate, and now Lions Den's charming and quirky Strawberries in January. The play can be described in simple terms as a romantic comedy with a happy ending, but it has a lot more than that going on. It's the story of four inter-connected lovers told in a cinematic fashion that involves rewinds and rewrites. The central character is Francois, a hardworking good-guy who's smitten with his adorably infuriating roommate Sophie. Sophie falls for Francois' friend Robert, a professor with a secret who in turn has had a relationship with Sophie's idealistic childhood-friend Lea. While it may sound like a soap opera, it's much sweeter and more clever than that, and will leave you with a smile on your face.